WWII amphibious plane that served many roles. Amphibious aircraft for the VIP turned into a Coast Guard work-horse. We were “weathered in” in Ketchikan, and while the first three legs had been great, this one was different. 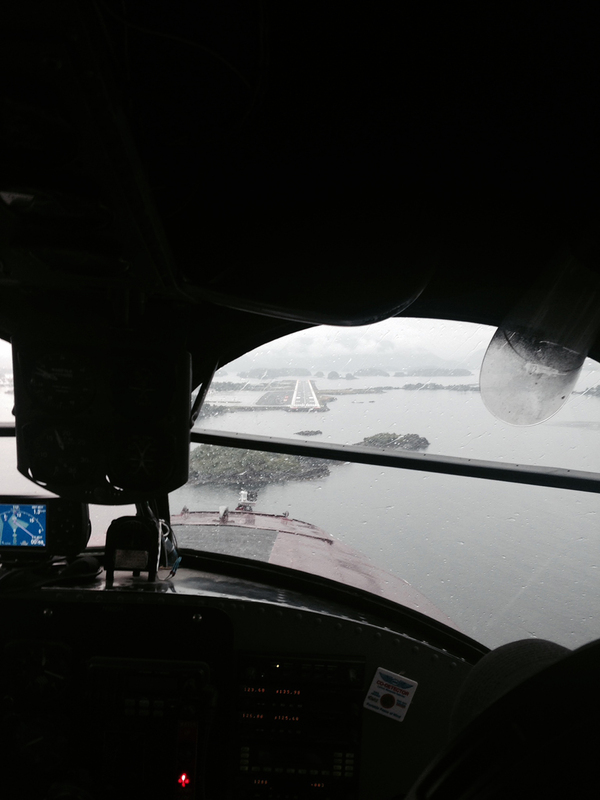 Our Goose is a VFR airplane, and while the weather was lousy today this was normal for coastal Alaska. Should we attempt to cross the 300 mile stretch to Port Hardy BC in two to three miles of visibility with rain showers at low altitude? Or would it be wise to wait for better weather before attempting to cross the coastal range of BC? A bit different than the California coastal range, this one is at least six to eight thousand feet high, cleverly covered with snow and ice to match cloud innards, and wild. Bears and other beasts inhabit this land, so landing and being on foot in this area is not a great prospect. This very plane has already crashed in this part of Alaska… twice before. survivors is enshrined at the National Air and Space museum representing Grumman’s first monoplane design, as well as their first twin engine airplane. The “little” 8,500lb seaplane was designed to be a business and sportsman’s aircraft in 1937 and just beat the F4F Wildcat into the air. 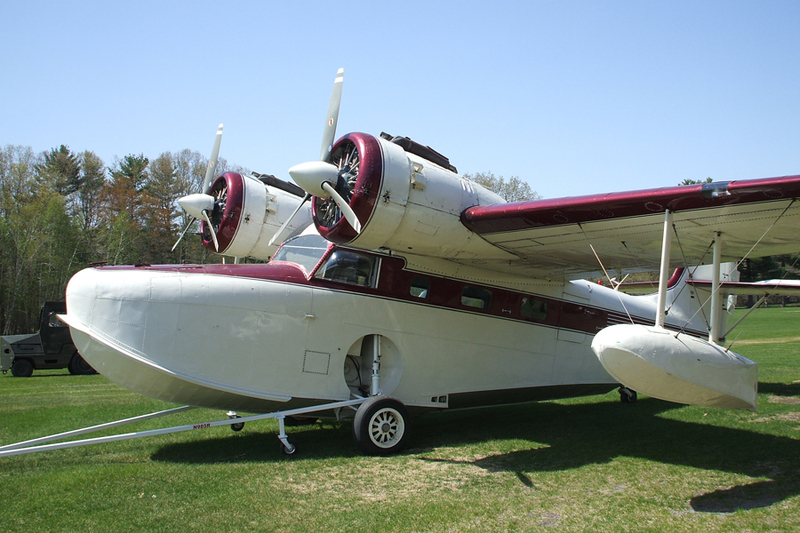 The two-step hulled seaplane was “right” from the start. Flying six hours and ten minutes over the first three days, it landed smartly on the water after her first flight. The company delivered airplane number two thirty five days later. The Goose was never produced in large numbers or cheap. They were hand built at a rate of no more than 5 per month as a high-cost specialized airplane. 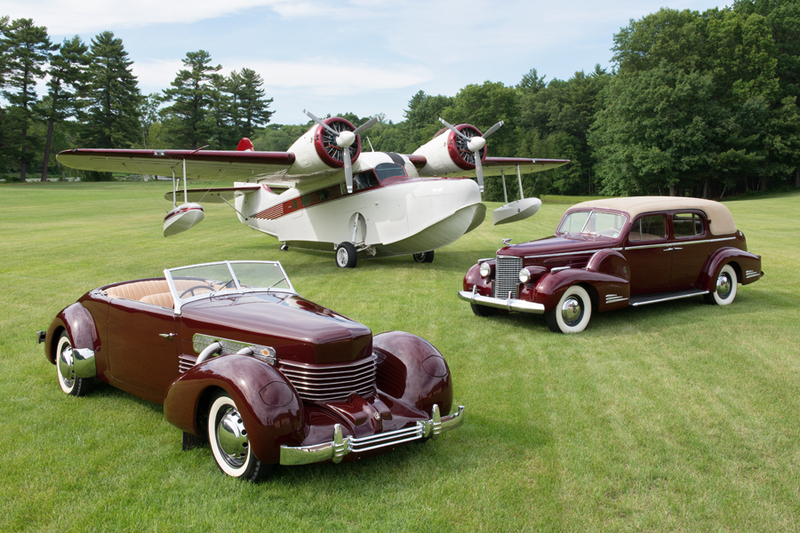 From May 1937 to October 1945 only 345 were built. The civilian design was so good that military buyers began purchasing the plane, with #16 going to Canada, and #21 and most all of the subsequent serials, to the US Navy and Army. Throughout the war, the Goose served as a utility, patrol, and rescue aircraft. It provided excellent service worldwide. The $62,180.00 Gooses were sold to the civilian market by the WAA for between $6-10,000. They found ready buyers in the postwar market. Always expensive, Goose airframes were continually rebuilt. Crashed parts were re-used in other rebuilds to keep the fleet going. The Goose cannot be replaced in its job, except by another Goose. The fleet flew until in 2007, and the last airline Goose was retired. Used in hazardous areas and remote outposts, time and fate chose victims until they were almost all gone. Today there may be thirty flying Gooses left. 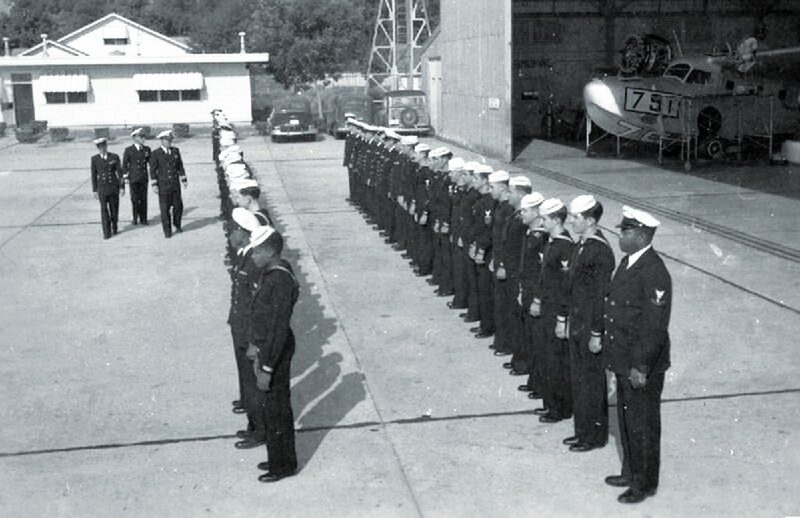 Repaired and discharged by the USN, the aircraft was formally assigned to the US Coast Guard in 1946. She served in Biloxi until 1948 before flying north to Alaska in August. Assigned to Coast Guard Station Annette (near Ketchikan), she flew in the hazardous Alaska weather, and was damaged landing. On August 10th, 1950 she lost her right float and damaged her right wing striking a dock! Heavily damaged and in a remote area, the USCG removed the engines and equipment and struck her from records on September 19th, 1950. Put up for auction as surplus equipment in March of 1951, she was sold for $230 at CGAS Annette to Bob Ellis who towed his damaged prize to Ketchikan behind his crash boat “Zodiac” for a lengthy rebuild. Bob Ellis is one of the most important early Alaskan Airline owners and bush pilots, and his Ellis Air Lines had a fleet of aircraft providing access and shipments of supplies into the Alaskan bush. By February 3rd, 1954, 84791 was certified as a G-21A and civilian registered as N4763C with 1,780 hours on the airframe. Interestingly, Bob Ellis decided he did not need the “amphibious” nature of 4763C and she entered service with landing gear removed as a “flying boat”! She flew all up and down the inland waterways of southern Alaska, and landed where there weren’t any runways for 7 years before her next accident. 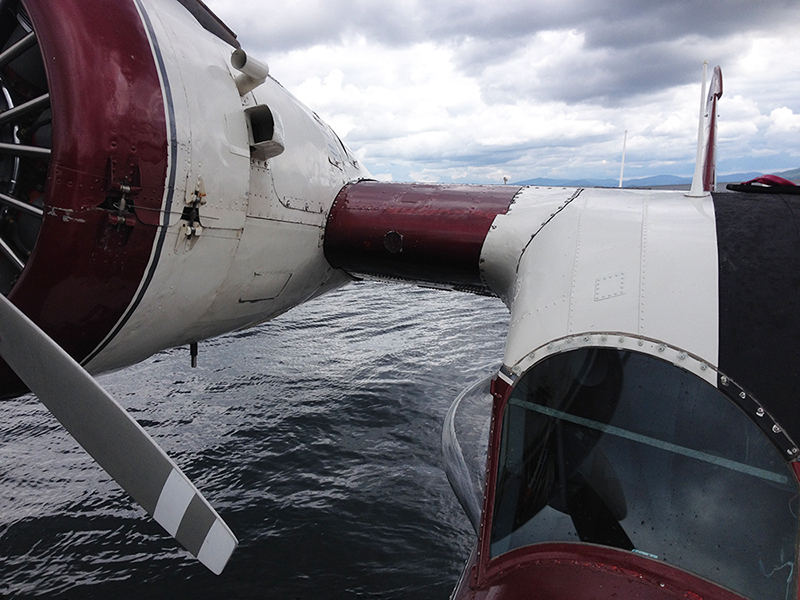 Paul Mattle of Ellis Airlines was landing at Whale Pass, north of Ketchikan, and struck a submerged log on landing. As the wounded Goose rolled over and sank, he dove in and saved his female passenger from drowning in the plane. Still a valuable plane, the tough plane was refloated and again towed to Ketchikan by a crash boat (seaplane operators have crash boats…that should tell you something.) She again went into a long-term rebuild. As military 84791 was being pieced together, Alaska was changing, and the once numerous Gooses (they are NEVER called Geese) were being supplanted by landplanes as runways were constructed throughout the new state. There was still an essential need for seaplanes, but airlines began to turn away from the hazardous parts of their operations and focus on safe and reliable timetables. The pressure forced a merger for Bob Ellis.The new Alaska Coastal/Ellis airlines operated PBYs and Gooses for a few more years before more mergers resulted in what we now know as Alaska Airlines. During the economic strain, the still unfinished Goose was sold. The Goose was finally finished in 1972 and registered to Bob Reeve, another Alaskan aviation legend. She flew for him and then PenAir for the following decade and a half. She was overhauled at one of the finest shops for seaplanes, Viking Air Ltd., in Sydney, BC. In 1982, she had been returned to like new condition. It was during this time that she was one of the “Aleutian Gooses” flying needed personnel and equipment to the far-flung government outposts on those islands. Dealing with the most dangerous weather in one of the most remote locations on the planet speaks highly of that little airframe designed in 1936. She operated until another rebuild with Dennis Buehn in the 2002 – 2003 time frame, where she acquired a new registration, N985R. After that, she was occasionally used in Alaska, until placed for sale as an aeronautical rarity. 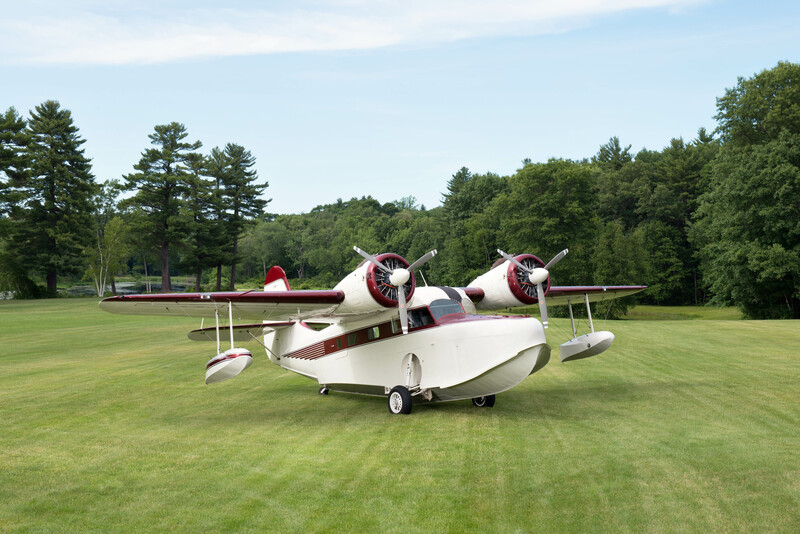 Who needs an amphibious seaplane from 1936 today? Her history, and rarity, as well as her present excellent condition, opens up a whole new type of flying for the Foundation. Seaplane Flying! And so, after 60 years of Alaskan service as a Coast Guard rescue aircraft, airliner, charter aircraft and bush plane, Navy 84791 returned to the lower 48 in July of 2014. The four thousand mile ferry flight was a grand adventure for those of us lucky to fly aboard this iconic aircraft, and as we stopped for fuel each time, the admiration factor of spectators and crew alike grew exponentially. Now at home in New England, Navy 84791 has earned preservation and conservation befitting a plane of her stature and history.